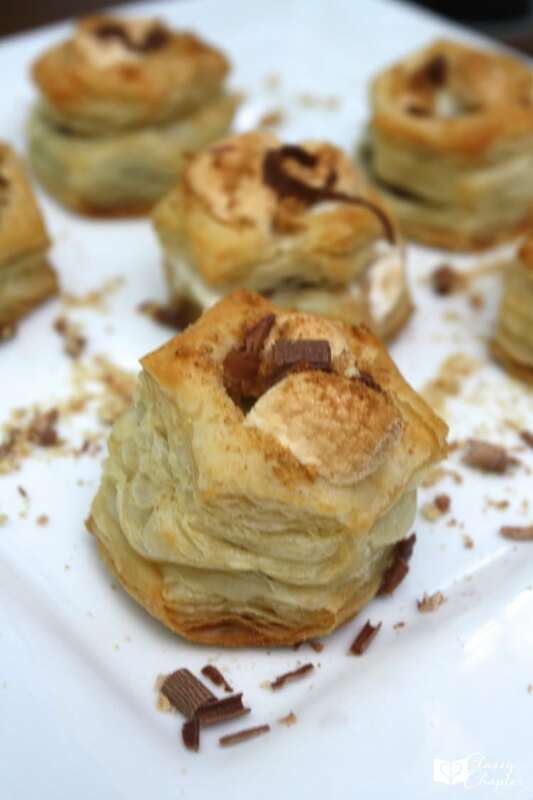 This s’mores recipe is the perfect treat between sweet and salty! With three kids in our house, it’s pretty safe to say we have a busy life. I love putting a smile on my families face with a tasty dessert, but I don’t always have time to bake. I’m a sucker for an easy dessert recipe! Add in bacon and chocolate and I’m sold! This recipe is definitely going on my list of best bacon recipes. While my kids love sweets, I’m more a savory person. 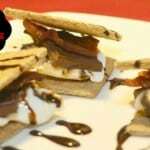 The bacon s’mores recipe in this recipe adds a nice hint of saltiness while still providing the sweetness you would expect from s’mores. Not only is this an easy dessert recipe, but it’s very budget friendly! Without even planning to make this, I had everything on hand. Any time I don’t have to run out to the store is a major bonus in my book. Cook your bacon until crispy and then set aside on paper towels to soak up some of the oil. You’ll then want to lay out all the ingredients on a plate, having them ready is a life-saver when you have a sticky marshmallow in your hand. Roast your marshmallows over the kitchen stove, outside barbecue or in your wood burning stove. 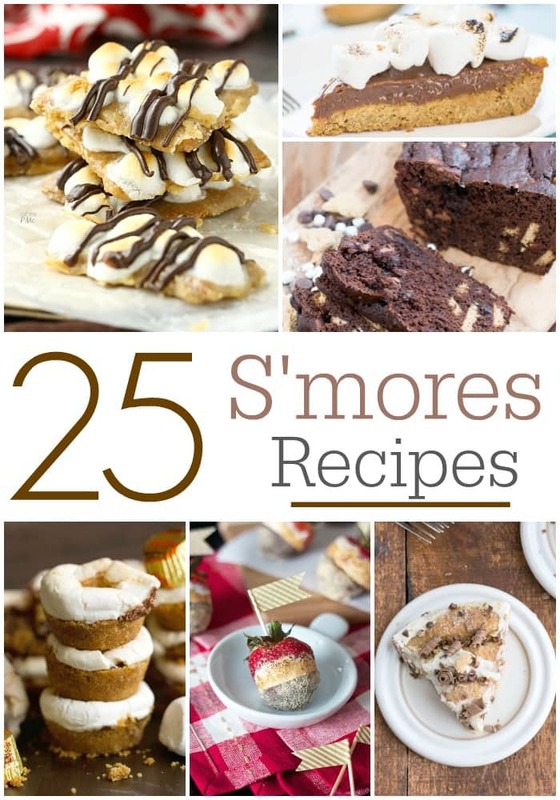 Once you get your marshmallow exactly how you like it, it’s time to assemble your s’mores! Place your sticky-gooey s’mores on a graham cracker with a piece of the chocolate candy bar over it and then top with a nice crispy piece of bacon. If you want to make the s’mores a little fancy (my kids like fancy desserts) then drizzle some chocolate sauce over the top. You can get creative and use different toppings, but my family likes to stick with the basics. Chocolate and bacon! If you want to find more recipes like this, make sure to follow me on Pinterest! You had me at bacon! These look really good, I am also more of a savory person. Right! Anything with bacon is delicious! Wow what a creative way to incorporate bacon. All the bacon lovers rejoice! My kids thought I was crazy at first….but they love it! Holy moly! This looks absolutely delectable! 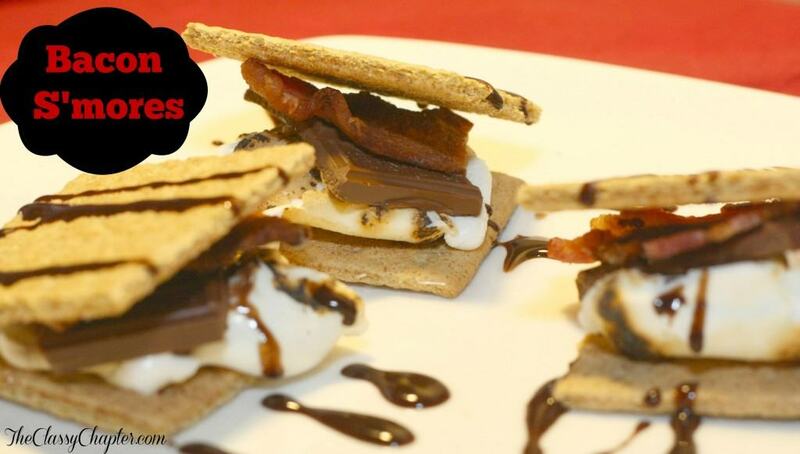 🙂 It’s combining two of the best things on the planet–bacon and s’mores! I can’t wait to try this. So yummy! Note to self: Don’t keep marshmallows, bacon or chocolate around! I’ll gain like 20 pounds. Looks delish! I had a candied bacon double chocolate chip cookie recipe I tried last year. Interesting flavor. I tweaked it a little. That sounds yummy! Anything with bacon is good, right? OMG… can I just say YES! Thanks for sharing at Sunday Features! Andrea@TablerPartyOfTwo recently posted…My Favorite Tote Ever! Thank you for stopping by! 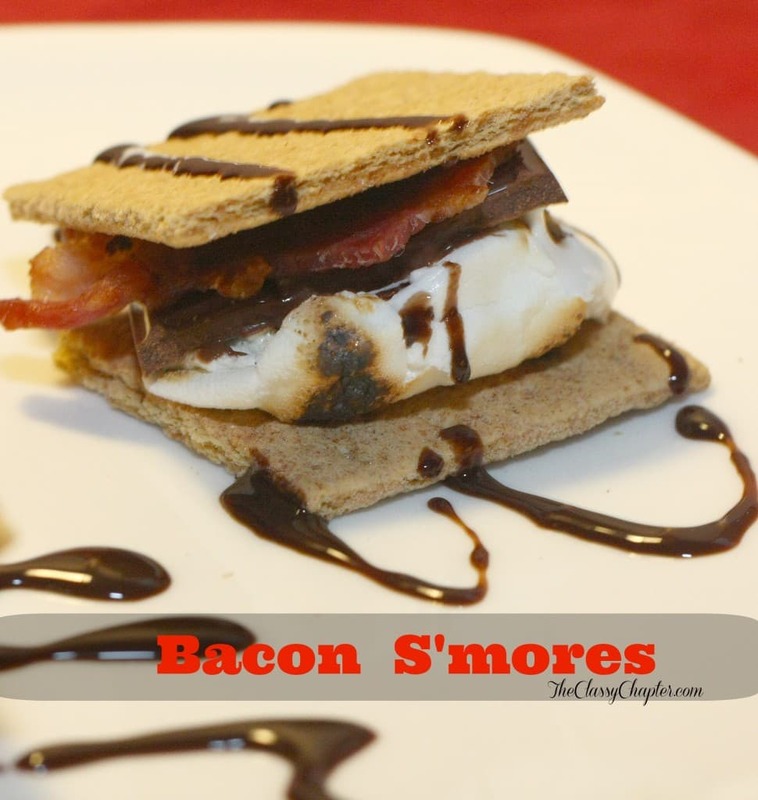 The S’mores are amazing…just don’t get cheap bacon 😉 I made that mistake once.